!!! 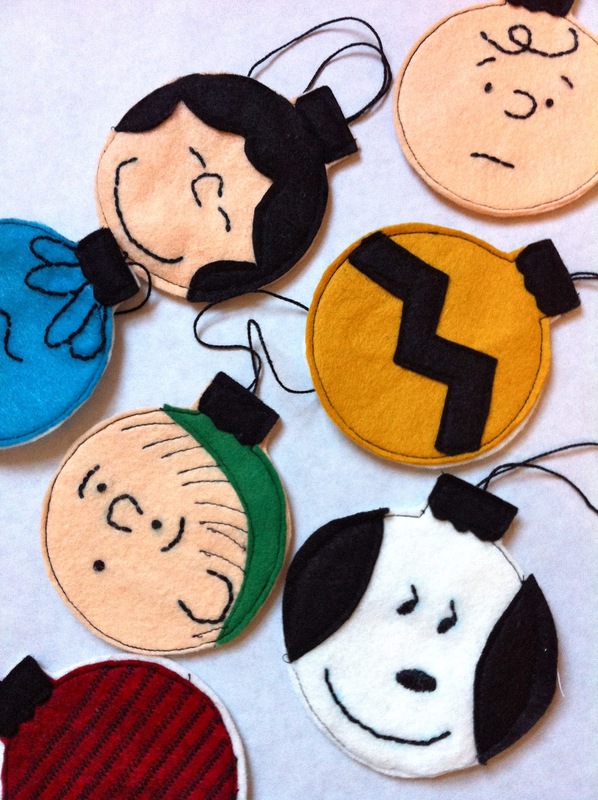 Update: You can now buy your own set of Charlie Brown ornaments from my Etsy shop, RIGHT HERE !!! This week for the Holiday Craft Bash, I made ornaments just for the kids. My projects so far have mostly been tributes to my favorite Christmas movies- how selfish! Hendrix was obsessed with Charlie Brown Christmas last year. We watched it every day into February, when Hulu finally got rid of it (thank goodness.) But then it was replaced with Charlie Brown Valentine's Day... not quite an instant classic, believe it or not. I actually got the idea for this from a set of cookies made to look like ornaments. So naturally, I decided to try the innovative idea of making ornaments that look like the cookies that look like ornaments. Creative genius over here. I added the faces of Charlie, Linus and Lucy to the mix, but I liked her idea of making some to look like their shirts too. I'm learning that there is nothing you can't recreate with some felt and a little perle cotton. It's my new favorite combo, essential for holiday crafting especially. Peach felt, white felt, and scraps in black, red, green, yellow, and blue. Cut out the felt shapes- from the ornament shape, cut 6 peach, 5 white and one each red yellow and blue. Each ornament will have a front and back main piece, as shown. 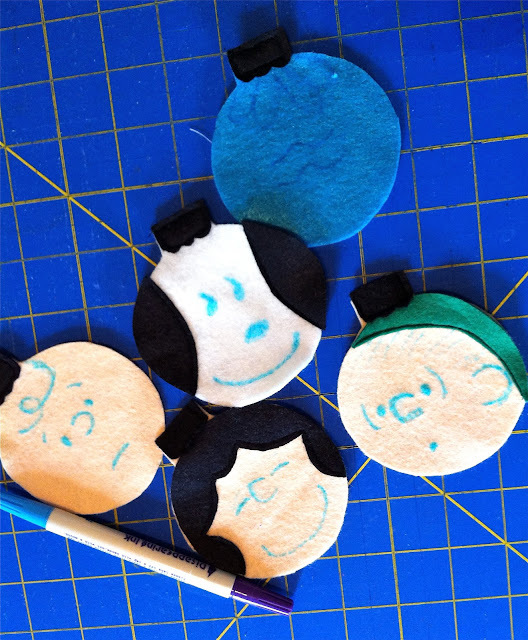 Cut 7 of the ornament toppers from black, as well as Charlie's shirt stripe, Snoopy's ears, and Lucy's hair. Cut out Linus' hat from green. Machine stitch the little topper pieces on every front ornament piece, as well as Snoopy's ears, Lucy's hair, Charlie's shirt stripe, and Linus' hat. Draw the faces and details on with a water soluble marking tool. Remember if you aren't happy with your drawing the first time, you can blot it out and start over. 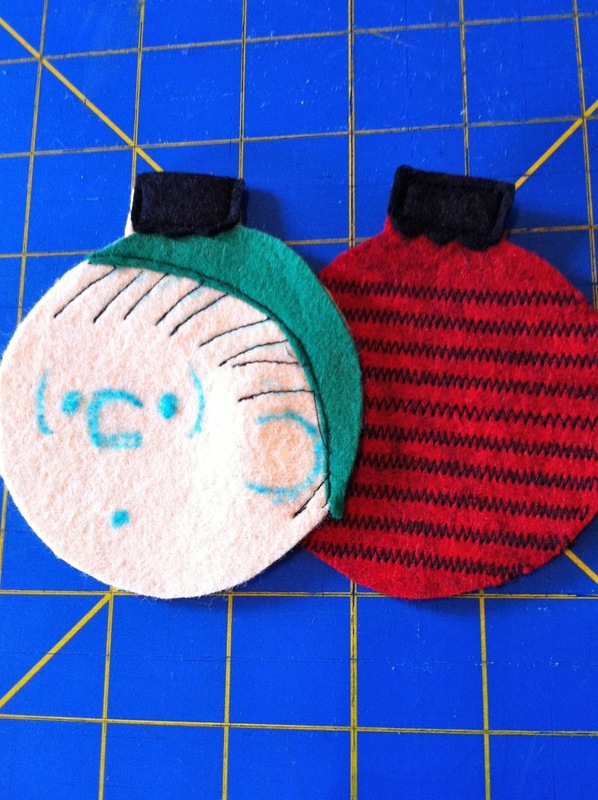 I added Linus' hair with machine stitching before starting the embroidery so that it would look extra scraggly. I also did his shirt stripes with a zig zag stitch on my machine. Now embroider the faces and details on each piece using backstitches, french knots for eyes, and a satin stitch for Snoopy's nose and eyes. These are not hard stitches to learn, and you can find great instructions right here. Cut a piece of your perle cotton about 8" long for each ornament. Fold it so the ends are together and glue it to the inside of the back piece. 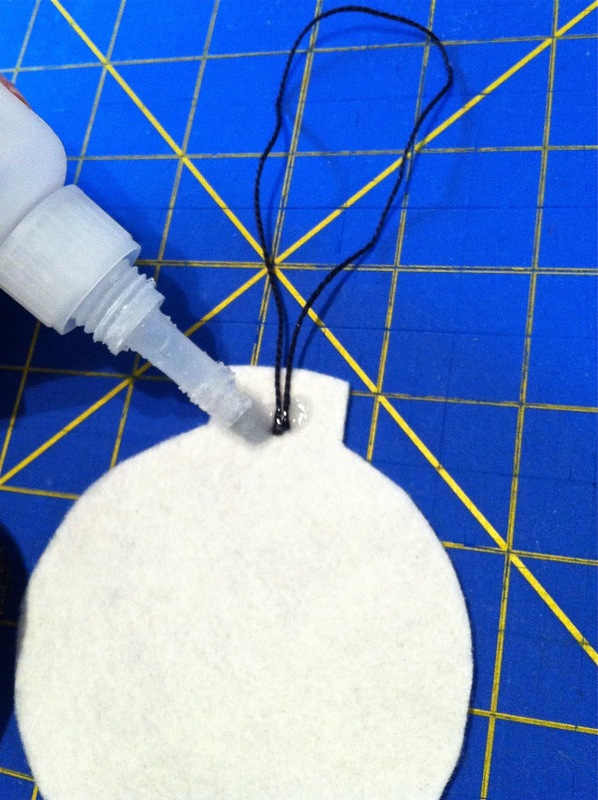 After the glue dries, place the fronts and backs together so that the glued string is sandwiched inside. Machine stitch all the way around each one and your ornaments are complete! 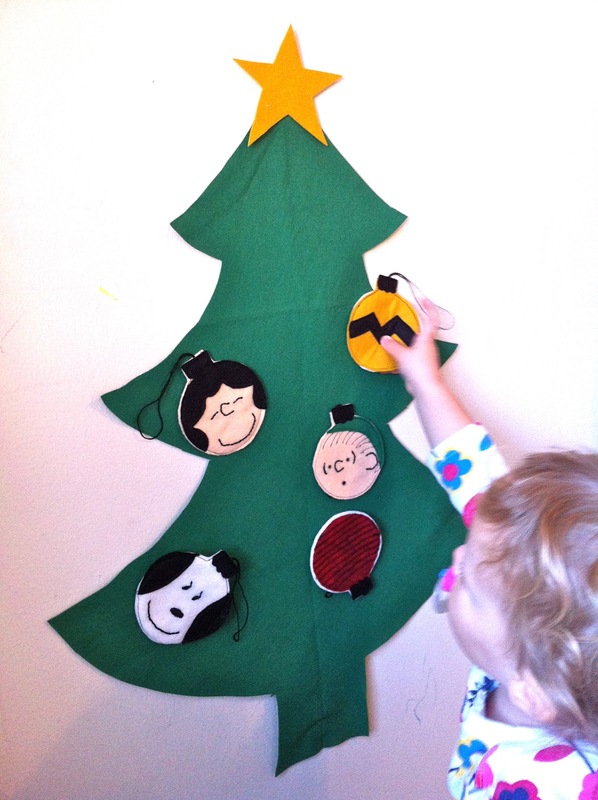 Since we definitely don't have a tree up yet, I decided to let the kids have some fun with a little felt tree taped on the wall. Mine is about 25"by 20". The kids love arranging the ornaments this way, and they will get to hang them on our real tree as well. The wonders of felt. Now that Halloween is over, I think we are going to start seeing even more great projects in the Holiday Craft Bash flickr pool. Don't forget to add yours! LOVE THESE! I've shown B all of your projects for this series and he really likes them too (wants me to make everything) - but THESE seem especially doable. Could even be festive Christmas coasters, eh? Total creative genius. I might make some cookies that look like your ornaments that look like cookies that look like ornaments. Or does that all cancel itself out? Anyway, I love these and that's the second felt play tree I've seen this week, off to order some green felt. So cute and what a great idea. A bunting is a great idea! lalala love these! So cute! Your embroidery skills rock. These are adorable! You are making such amazing decorations out all my favorite Christmas movies!! Let me know if you ever need any felt. I just put a huge order in and will be selling it once we get settled in the new house. you are crushing it with all your holiday decorations this year. crushing. it. 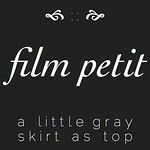 I'm worshiping you and your "crafty genius"
Hi, I'm Rosie and I've just found your blog and WOW it is fantastic. I really love it. Your pictures and craft work is amazing. I'll definitely be following with great interest. I absolutely love your holiday "aesthetic"! I want to copy all of them!! Great ornaments, and great tutorial! We are going to do this this year! Thanks!!! Those are so cute! Love 'em! I'm seriously in love with these. And totally impressed that you are working on Christmas ornaments. I say I'm going to make some of my own every year and then the holiday craziness starts and we're left with the cheap dollar store ornaments I bought the first year my husband and I were married. Maybe this year? 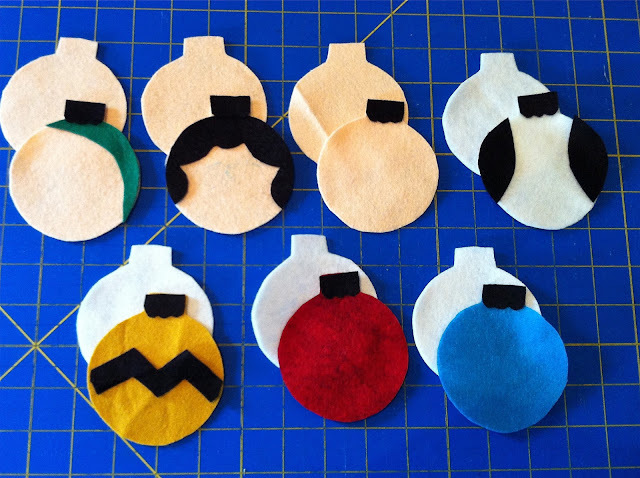 These are just too cute x) There's something about felt ornaments that is just so vintage. Love it! Seriously - you're killin' me with this. Barb is right...you're a craft genius. So jealous. love this! so super cute, and love it that you've introduced your kids to such a classic:) These will become heirlooms for sure! Jessica, these. are. awesome. the end. Any chance you have an etsy shop, and have these available? I am not good with stuff like this, it would be a hot mess. I'm in love with these! I'm making them today! Thanks! beautiful!!! Thank you for sharing!! any chance you have an etsy store? i would love to buy a couple sets! I love it! Thanks so much for sharing! Pinning it for later! So so cute...being a Peanuts fan I just love these. Going to try to papercraft them! OH!!! I love these so much!!! Why won't the pattern print? I love these!! Going to try them!! I am absolutley in love with these! 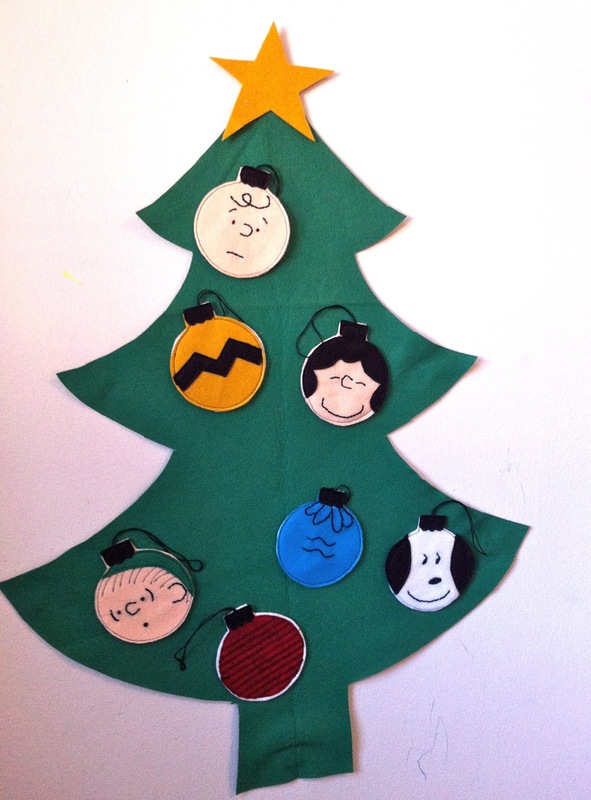 Our tree is almost all Peanuts ornaments to match the Peanuts tree skirt my mom made me years ago. I have to make these! Thanks for the tutorial! Great idea. I will try this at our children's church after we watch the movie and talk about the meaning. Oh my goodness, I love these! 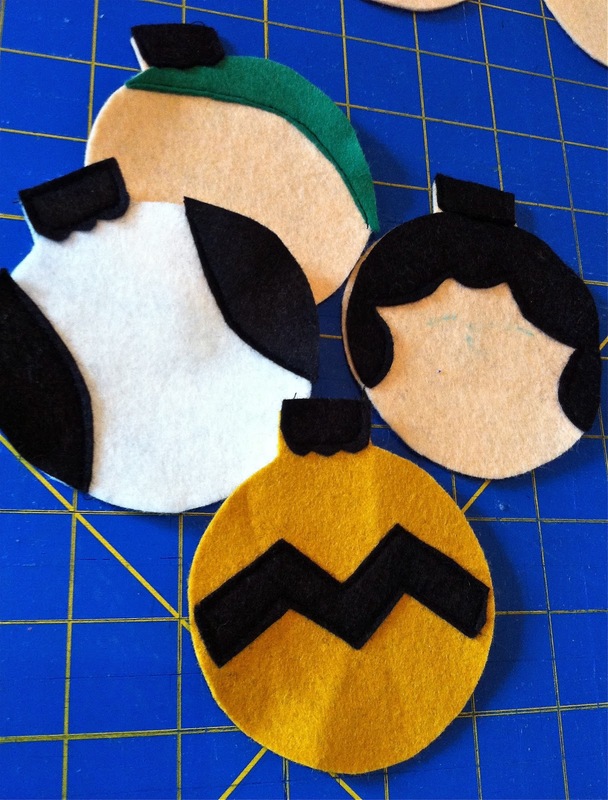 I'm going to make a Charlie Brown right now. And the Bumble stocking...I just love it! I'll have to experiment with these - my favorite Christmas characters are Charlie in the Box and the little elf who wants to be a dentist. :) Thanks for the great ideas and tutorials!! Oh my gosh! I love these! I am Snoopy's biggest fan:) I was just trying to figure out what ornament to attach to my presents as I wrap them this year...so excited to find this. I think I will be making these! Thanks! Oh that's a super cute idea to put them on gifts! How do you draw the pattern on black felt? Hi Fern, I don't draw the pattern on the felt, I cut the piece out of freezer paper (or any paper) and cut around it on the felt. Hope that helps! I tried out your pattern and added "a little festiveness" to the Snoopy to jazz up my gift wrapping...if you get a chance-see what you think! If I don't sew can't I just use craft glue or something? Can I glue or something instead of stitching. These are precious. Thanks for sharing. Such lovely faces. Now I have to put something similar on my X-mass tree! It would be great! Here I have other ideas how to creat a Christmas atmosphere. i cant find peach felt anywhere..i've checked hancock fabrics, joanns, michaels and ac moore..help! where did you get yours?? I got mine at my local quilt shop, called Sewn Studio. They sell nice wool blend felt in 12x18 sheets in lots of colors. I don't know if they could send you some in time for christmas, but you could call and check- 513 321 0600. Or try other places with fast shipping, like Amazon or even the supply section of etsy. (Just make sure and ask the seller when they can ship it by.) Or if you have a local fabric shop close to you, call them and see if they happen to have it. Good luck! 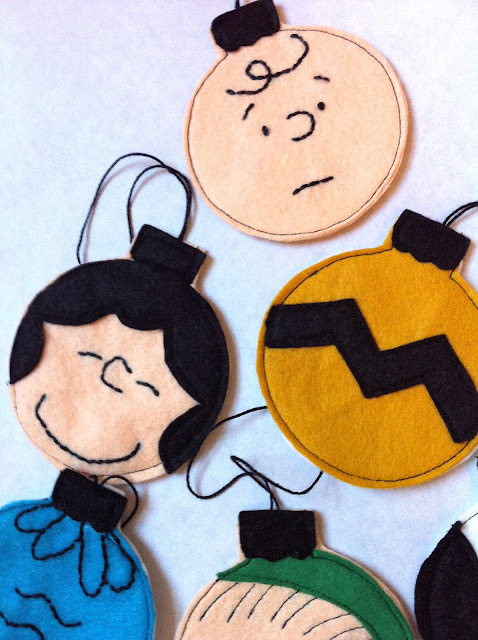 Thank you for posting the Charlie Brown ornament tutorial. I am planning to make myself a set in a few days. 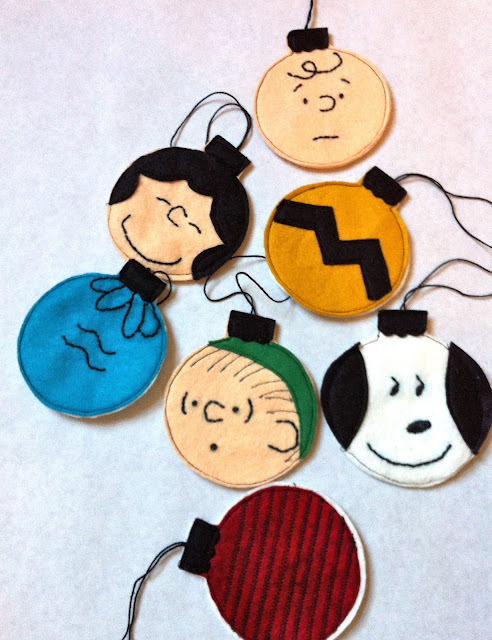 I'm excited that I found a Peanuts craft that will only cost a few dollars to make and still look cute! I love these! I have to make these! But I can't print the pattern on Google. Any suggestions? I really want to make these but I can't print the pattern. Help? I just love it.I am going to make this kind of Christmas gift for next Christmas.